Workshop "Multimedia Tools for Communicating Mathematics"
Conference book (with CD) available from Springer-Verlag. A developers' workshop with about 20-25 experts (finally we counted about 60) who have already produced or are involved in the development of multimedia tools for communicating mathematical experiments and theory, either for scientific research or educational purposes. 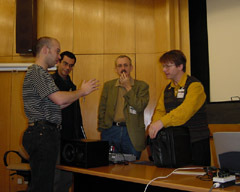 The workshop will give insight into the scientific methods and numerical algorithms implemented inside multimedia tools. It will provide an overview of the range of mathematical targets and solutions. The workshop is aimed at developers and not product managers, and focuses on the scientific aspects of the product, which might be software, a video, or a different media. A collection of articles on the scientific techniques used in each product will provide an invaluable and up-to-date reference book on presently available multimedia tools for Mathematics. The Springer-Verlag will publish this book in their series "Mathematics and Visualization". This workshop is organized by the University of Lisbon (CMAF), the Technical University of Berlin (Sfb288), and the Center for Experimental and Constructive Mathematics (CECM). It is under sponsorship of the European Mathematical Society and the Portuguese Mathematical Society.